Happy New Year to all our Circus Flora family and friends! Our spring production, “The Case of the Missing Bellhop,” wowed more than 22,000 guests during our first season in our brand-new, permanent home. We received so much incredible feedback – everything from “the performance was equal parts hilarious, heart-stopping, and pure fun” to “this was the third year, in a row, that I’ve attended and it was my favorite show yet!” The Kranzberg Arts Foundation’s Big Top venue was a spectacular backdrop for Circus Flora’s annual show, as well as other events throughout the summer and fall. Our annual Flora Dora gala, chaired in September by Dr. Barry & Alissa Duel, raised a record-setting $140,000! 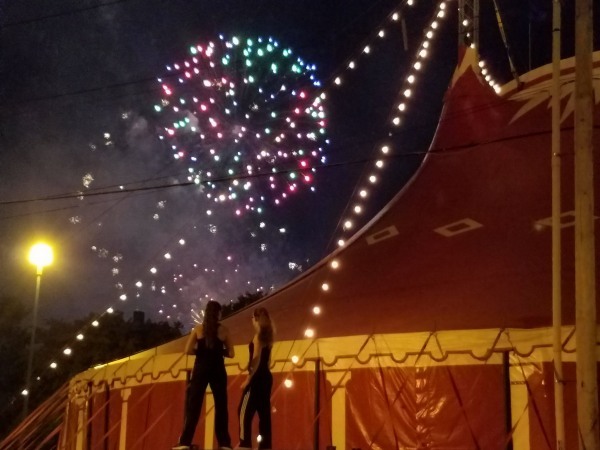 Not only was it a fantastic time, but the funds raised successfully launched us into planning for our 2019 Big Top production, with special engagements such as the annual sensory-friendly performance, and ensured the year-round continuation of our “Clowns on Call” program. Speaking of “Clowns on Call” and setting records, the clowns visited a record number of children and their families in SSM Health Cardinal Glennon Children’s Hospital in 2018 – a 33% increase over 2017, thanks in part to the addition of monthly Circus PlayDays and expanding into new areas of the hospital. Great job, Audrey Crabtree, Tom Eggers, and Celia Shacklett! The new year has been a busy one at Circus Flora. We are off to the races (or, shall we say, the supermarket) planning for our 33rd Season production: “The Caper in Aisle 6.” This show will run June 6 through 30, 2019 – that’s right, we are returning to summer! We have an exciting show planned, with acts never-before-seen in the Big Top, and the return of a favorite (or two). We are excited to welcome the new year and to welcome you into the Big Top this summer. With added group amenities, lots of fun promotions, and a fantastic new show concept, you’ll find so many things to love about Circus Flora.